We, my husband and I, were the last to go. 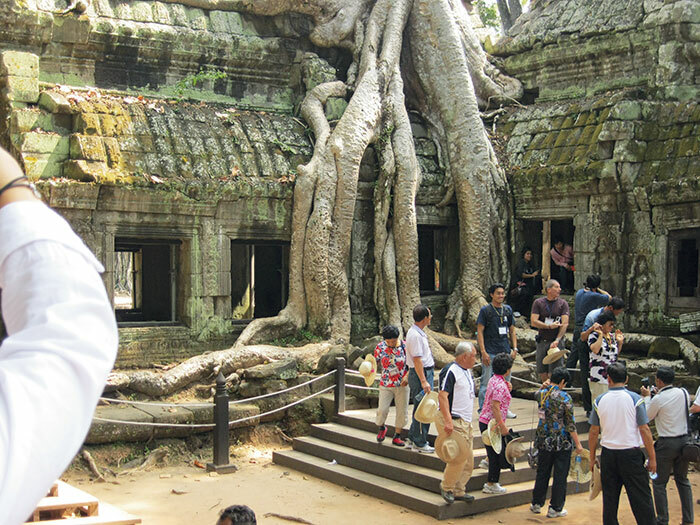 Everybody from our extended circle of friends afflicted with wanderlust had ‘done’ Angkor Wat and other archaeological wonders of Cambodia over the course of the last decade. Done? It’s such a tacky word, as if one were ticking a to-do list of chores. Our peregrinating friends would come back from Cambodia, elated, and rather condescendingly tell those of us who had not ventured further east than Kolkata that we were ‘overdoing this Europe-Shorup thing’. The East, they pronounced, was far more exciting. So, we turned east, to Siem Reap. Located in the north-western part of the country it is the gateway to the millennium-old, famed Angkor temples of the ancient Khmer Empire. Stunning, spell-binding, overwhelming – one could endlessly summon up adjectives to describe the majestic splendour of the high-rise temples of Bayon and Angkor Wat, Tah Prom, and Bantay Sprey. Angkor Wat, spread over 240 hectares and surrounded by a huge moat, is the largest religious monument in the world. Not surprisingly there were at least a dozen newlyweds in their bridal finery posing against this picturesque backdrop for professional photographers. They reminded me of the bridal couples being photographed in Moscow in front of Lenin’s mausoleum in pre-glasnost times. Religion then was a dirty word and newlyweds had only monuments to give their civil ceremonies a touch of sanctity – or, to lift them out of the realm of the ordinary. 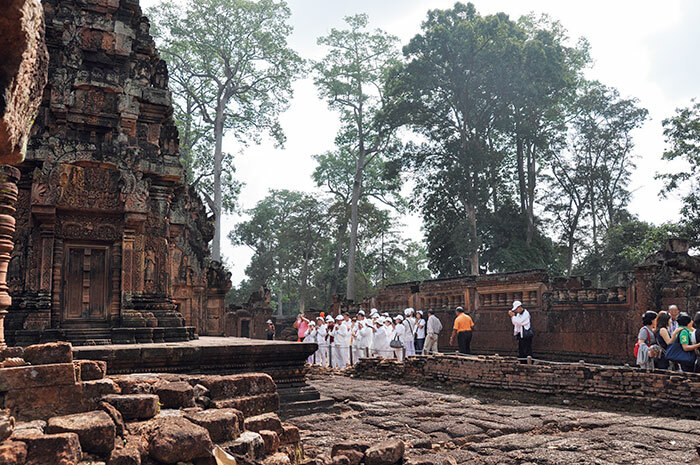 Originally known as Vrah Vishnulok – the sacred abode of Lord Vishnu – Angkor Wat was a Hindu temple dedicated to Vishnu by Khmer king Suryavarman II in the first half of the 12th century. The eight-armed statue of Vishnu was dislodged from its hallowed space in the central shrine when Buddhism became the predominant religion towards the end of the 12th century. King Jayavarman VII, a convert to the Mahayana Buddhist sect, erected Buddhist shrines in Angkor and many Hindu shrines were transformed into Buddhist ones. Isolated and somewhat battered by time, Lord Vishnu of Angkor Wat now stands in an outer gallery. But that doesn’t stop the local Cambodians and the milling tourists – many of them Buddhists from Japan, South Korea and elsewhere – from worshipping him. Or, indeed the Hindu deities who no longer occupy the inner sanctums of the temples but whose presence is marked by the men and women crouched in front of them, their eyes closed and palms joined in prayer. Shivlinghams, ubiquitous in many of the Buddhist temples, are still being worshipped by people who, I am convinced, do not know what these represent. We saw many Cambodians and tourists place incense sticks or flowers before them. Guides who attach themselves to you, even unbidden, can sometimes have a tangential relationship with truth. Ours at Angkor Wat certainly did. Buddha was according to him a Brahmin; and the Shivlinghams, often broken, were just some stones. But we struck lucky with an eight-year-old boy at Preah Khan, a hauntingly beautiful ruin that once housed a two-storied library of manuscripts and a hall of apsaras, heavenly dancing girls whose latter-day avatars in bars and restaurants of downtown Siem Reap are far less heavenly, with their delicate feet firmly on the ground. His words bring to mind the taxi driver who brought us into town from the airport, past myriad luxury hotels, including Raffles, past the mint new buildings emulating traditional Cambodian architecture, past massage parlours and past elegant shops. “Recently one of our leaders said that the two industries that are doing the best in Siem Reap are education and religion,” he explains. Our little guide at Preah Khan and countless other young children from poor families are able to work in the morning and attend school in the afternoon. However, the taxi driver’s remark about the ‘progress’ of religion surprises me. Why was religion on the official agenda? Certainly, there were people praying inside every Buddhist temple we passed, even the little ones tucked away in Siem Reap itself – no matter what time of the day or day of the week. And then the penny dropped. This was Pol Pot country. The killing fields of Pol Pot were all around us. Pol Pot’s men had also carried out target practice in these sacred spaces. Several temples bore the scars of the bullets of the Khmer Rouge. The communist dictator had wiped out almost an entire generation of Cambodians; and exiled the educated from the cities to work on the land in the countryside. Pol Pot had also banned religion. It had now returned with a vengeance. India may have given this land its major religion, and some of its cultural vocabulary. But I wish we had taken something back in return, for a start the prevalent gentleness of the people in this balmy, temple-dotted land. There is an air of serenity and smiles predominate, as does the ubiquitous ‘sorry’, almost as omnipresent as ‘hello’ or ‘thank you’. Even the noisily persistent tut tuk-valas (motorbike rickshaws) stop this side of aggression. Anger has gone underground. Siem Reap is relatively inexpensive, has great shopping and food. When the sun goes down, Pub Street, by day a place to shop and get the best croissants in town becomes the happening place for tourists. But I never realised just how happening it could be. When we passed by the intriguingly named (and in this case ironically as well) Lingha Lounge we saw a middle-aged white man engaged in the kind of activity with a young Cambodian man that is best carried out in private. The ladies of the night, shepherded by an efficient-looking madam of sorts, had also begun to surface, openly soliciting diners in restaurants and bars. The smiles, however, were still in place, as was the serenity.